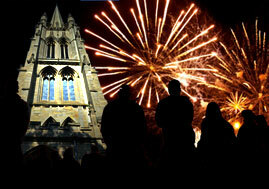 Spire celebrates its birthday in style! 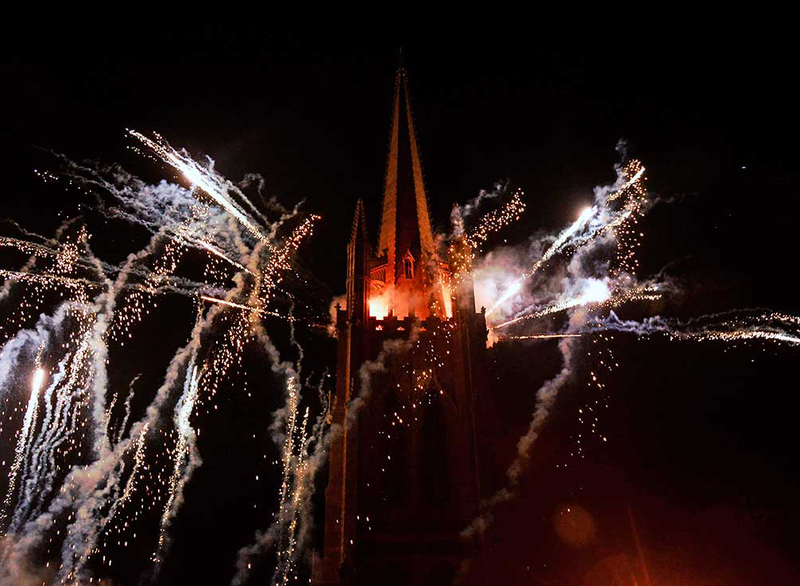 The celebrations of the 500th birthday of the graceful spire that crowns the Parish Church of St James came to a dramatic climax on Sunday with a series of events ending with a spectacular firework display from the church itself. On Sunday morning members of the regular congregation were joined by a number of visitors – including a group from Williamsburg Virginia whose visit reflected the long links between Louth and what are now the eastern states of the USA. At the service the Bishop of Grimsby preached a sermon that drew on the place of the church as being at the spiritual heart of the community and rededicated the spire as the crowning glory of a building that has been at the centre of Louth for many centuries. During the afternoon many visitors made their way into St James and the bells were rung – pealing out over the town’s Victorian Market. The Parish Church of St James in Louth is hosting a wide-ranging programme of events during 2015 to mark the 500th anniversary of the completion of its crowning glory - the tallest medieval parish church spire in England. Starting with events during the Easter period there is a full programme leading up to the Anniversary Weekend, on the 12th and 13th September, and continuing through the autumn. Working together with a wide range of partners and community groups who are associated with the building the church looks forward to welcoming from across the community to celebrate the history and life of a building that has been at the heart of louth for well over a thousand years. 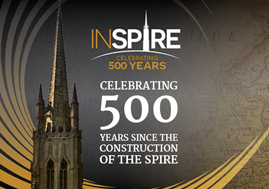 Plans for events to celebrate the 500th anniversary of the completion of the Spire are now well underway and we start the programme with an Open Chess competition in the Nave on March 28; click on the event tab to get more details. The highlight of the celebrations will be 13 September when we are joined by visitors from Williamsburg USA who hosted some of us on our visit to them a few years ago to commemorate the 400th anniversary of John Smith’s settlement in Jamestown. But there are activities and events throughout the year so keep checking this website!